The subtext to Ryan’s statement was that if Trump had obstructed justice when he fired Comey—if he had acted criminally when demanding “loyalty” from an ostensibly independent FBI director or when requesting that Comey “lift the cloud”—that it was all simply a misunderstanding. Trump, Ryan implied, was just incompetent, so hopelessly bad at his job that potentially illegal actions are just the fumbling missteps of man ill-prepared for the complexities of it. 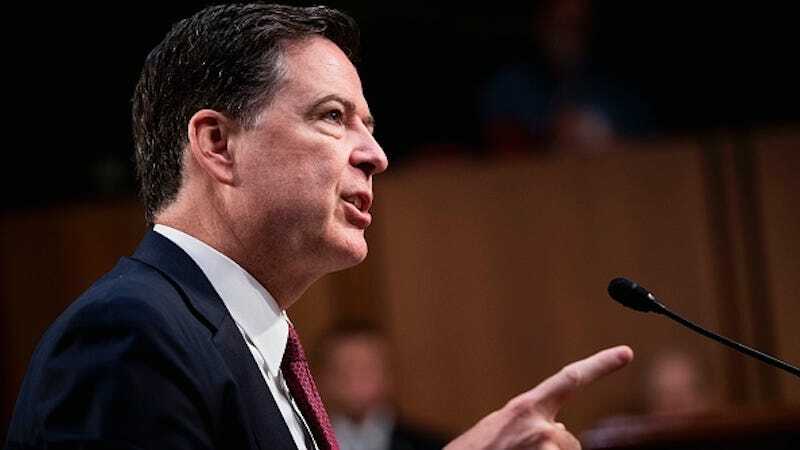 It was a theme that persisted throughout Comey’s testimony as Senators curiously asked him why he hadn’t explained to the President of the United States how to do his job. During Marco Rubio’s question period, the junior Florida senator asked about an Oval Office meeting between Comey and Trump during which Trump allegedly asked the FBI Director to end the investigation of Michael Flynn. “I hope you can let this go,” Trump said according to Comey’s memo. Comey took Trump’s request as less of a pleasant or polite request and more as a demand. At the time, did you say something to the President about, ‘That is not an appropriate request’... Or did you tell the White House counsel, ‘It’s not an appropriate request?’ Someone needs to tell the President he can’t do these things. Comey responded, “I didn’t, no.” Rubio’s follow-up is simply, “Why?” It’s a curious exchange; a Senator’s demand that “someone” tell Trump that he can’t interfere with an ongoing investigation. It presumes that a grown adult, someone elected to the White House, has little to no knowledge of either America’s history or its laws. It presumes, too that he has no one to ask, needing instead the ready reprimands of James Comey. It’s very likely that Trump is completely ignorant of legal and ethical expectations; likely too, that he does not simply ask because he is unable or unwilling to admit that ignorance. Either way, that’s the essence of incompetence. ﻿Collins, like Rubio, seemed to be putting the onus on Comey, consistently hinting at an open secret: that Trump is criminally bad at his job. And here, Rubio offers it up as a rational defense, insisting that criminal action is a natural course for a president learning on the job. In his response, Comey implied that educating Trump, a man who was his superior, was not exactly his job. Comey said that he was “stunned” that Trump made the Flynn request and “didn’t have the presence of mind,” to act as a wary Virgil through these new and exciting rings of hell. “I don’t know if I would have said to the President [even] with the presence of mind: Sir, that’s wrong,” Comey added. Rubio’s line of questioning was reiterated by Maine Senator Susan Collins. But I remain puzzled by your response: ‘Michael Flynn is a good guy.’ You could have said, Mr. President, this meeting is inappropriate. This response could compromise the investigation. You should not be making such a request. It’s fundamental to the operation of our government, the FBI be insulated from this kind of political pressure. But my question to you is later on, upon reflection, did you go to anyone at the Department of Justice and ask them to call the White Souse Counsel’s office and explain that the president had to have a far better understanding and appreciation of his role vis–à–vis the FBI? Collins, like Rubio, seemed to be putting the onus on Comey, consistently hinting at an open secret: that Trump is criminally bad at his job. Republicans on the committee insisted throughout the hearing that it was Comey’s job to prevent the President from committing obstruction, rather than the President’s job simply not commit obstruction. It’s an odd demand, a near-acknowledgement that Trump engaged in potentially criminal action by demanding that Comey close the FBI’s investigation of Flynn, coupled with a built-in defense: the President, they seem to argue, acted without knowledge of the law because he simply doesn’t know how to do his job. Trump’s actions may be criminal, but they are excusable because he’s a well-meaning idiot. This defense isn’t particularly new but it’s become a routine line of defense for men accused of corruption and criminal acts. George W. Bush, for example, wasn’t acting maliciously when he mishandled the Iraq War or the aftermath of Hurricane Katrina, he was simply unable to grasp the complexities of his job. He was, the defense goes, simply incompetent. As was current Florida Governor Rick Scott when the hospital company that made him a million was indicted Medicare and Medicaid fraud—he just didn’t know his company was stealing hundreds of millions of dollars from the federal government. This list could go on and on, and include on it numerous politicians and CEOs—powerful men for whom incompetence has somehow become an acceptable excuse for criminal behavior. I suppose the incompetence defense is simply more evidence that our institutions were built solely for the protection of certain men even, as Comey’s testimony showed, they are increasingly ambivalent about their maintenance. Still, the subtext is repetitive, replayed on a silent loop every time a powerful man is accused of nearly anything: These men are never acting maliciously, never with purpose, but instead stumble into misdeeds simply because they can’t always grasp the complexity that their difficult and important jobs demand. The implication is, of course, that anyone could unknowingly commit such crimes but that, of course, is a myth. And yet we continue to believe it, to repeat it out loud without a flinch, because it is part of our national mythology of powerful men.